Such was the demand from auditors in the West for L. Ron Hubbard’s personal instruction that he scheduled a “Western Clinical Course” in Phoenix, Arizona. Jubilant Western Dianeticists and Scientologists little knew how well‑founded their exuberance was. Although the talk was of SOP 8‑C, Mr. Hubbard had already advanced its use with a special form of SOP 8‑C, one that could be audited on a group. But if students experienced that breakthrough at the preceding Congress, what awaited them on the 3rd American ACC was not only SOP 8‑C to accomplish Theta Clear, but SOP 8‑O to achieve an even higher goal: Operating Thetan. Addressed to the thetan exterior, SOP 8‑O marked the development of a procedure intrinsic to restoring a thetan’s ability to handle energy. 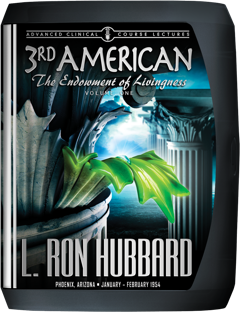 As L. Ron Hubbard stated, “You’re working in the high level of knowingness of the thetan. And, of course, his potentiality of knowingness is total.” Thus came a range of skills, including Opening Procedure of 8‑C used with the next‑to‑last list of Self Analysis on both lower‑level cases and exteriorized thetans. In addition to technical advances, the 3rd ACC marked a watershed organizationally, with Phoenix becoming headquarters of the Hubbard Association of Scientologists. Such was the intensity of the demand from auditors living in the West to be personally trained by L. Ron Hubbard that shortly after the commencement of the first Advanced Clinical Course in Camden, New Jersey, he scheduled what he termed a “Western Clinical Course” for early 1954. While two of his staff traveled ahead to Phoenix, Arizona, to prepare for both the Clinical Course and the Congress that would precede it, Mr. Hubbard completed delivery of the 2nd ACC, leaving Camden shortly thereafter. Given that he had not been to Phoenix in two years, the western Dianeticists and Scientologists were exuberant. But little did they know just how well-founded their exuberance was. For while the talk of the Scientology world was Standard Operating Procedure of 8-C (SOP 8-C), Mr. Hubbard had already advanced its use to unimagined heights, very much including a special form of SOP 8-C for auditing a group. But if students first learned of that breakthrough at the Western Congress, it was but a foretaste of what awaited them when the 3rd American Advanced Clinical Course opened on January 4, 1954. For here L. Ron Hubbard taught not only SOP 8-C to accomplish Theta Clear, but the full application of Standard Operating Procedure 8-O to achieve an even higher goal: Operating Thetan. Addressed to the thetan exterior, SOP 8-O marked the development of a procedure intrinsic to the restoration of a thetan’s ability to handle energy and to grant life. And, how Opening Procedure of 8-C is used with the next-to-the-last list of Self Analysis on both lower-level cases and exteriorized thetans. But for all else the 3rd ACC signified in terms of technical advance, it also marked a turning point in organizational establishment and the widespread dissemination of new discoveries. For while continual demand for Mr. Hubbard’s personal instruction had already resulted in acquisition of new quarters twice over in New Jersey—it was here that he found the ideal locale and quarters to carry him well into the future. To just that end, and with a complex of offices across several buildings, L. Ron Hubbard moved all operations and saw to the permanent establishment for the headquarters of the Hubbard Association of Scientologists in Phoenix, Arizona. So opened the first chapter of the Scientology era in the Valley of the Sun, an era that would forever be known as the Creation of Human Ability.